« Travel Luggage – What’s best? Christophe Pelet from France, shares images and word of New Zealand with heart. A fellow traveler and volunteer hut warden at *French Ridge, *Frenchman (*coincidence? Maybe not) Christophe Pelet has become a good friend of ours. In fact he’s been hanging here in Auckland before he heads back to France. 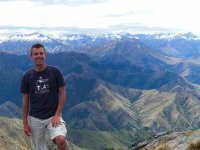 He’s been traveling New Zealand since late 2008 and been writing a great blog. But it’s in French so you’ll have to sharpen your French reading skills. He’s one of the best photographers I’ve seen, the images he creates through the lens of his camera are stunning and moving. See Christophe’s Blog where his most recent entry is called “The Top of New Zealand. This entry was posted on 23/05/2009 at 01:59 and is filed under New Zealand, Sustainable Living/Communities, Traveling. You can follow any responses to this entry through the RSS 2.0 feed. You can leave a response, or trackback from your own site.